A team of students from Hebrew University of Jerusalem has developed unique pressure-sensing socks that, when linked to a smart phone app, warn diabetic patients of developing foot ulcers. Called SenseGO, the machine-washable socks contain dozens of micro-fabricated pressure sensors. 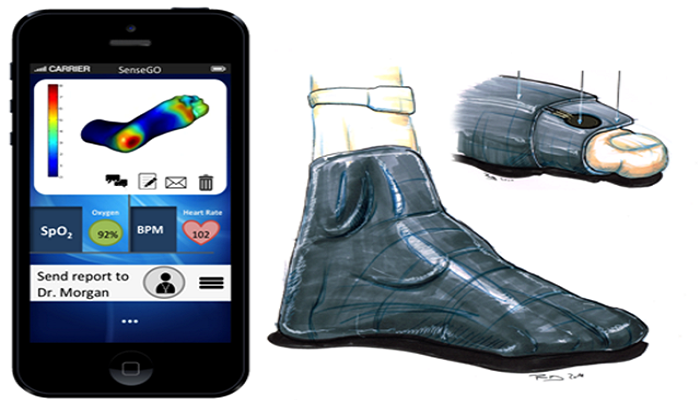 With SenseGO, changes in pressure due to incorrect posture, anatomical deformation or ill-fitting shoes are registered as electrical signals that are relayed to a smartphone app, which, in turn, informs the patient of developing wound risk. Diabetic neuropathy is a type of nerve damage associated with the development of foot ulcers in patients with diabetes. Resulting from anatomical deformation, excessive pressure and poor blood supply, it affects over 130 million individuals worldwide. "This is a significant medical problem that affects the lives of millions. We thought there must be a way to avoid these wounds altogether," said Danny Bavli, the group's lead engineer, in a university statement. Bavli partnered with Sagi Frishman and Dr David Morgenstern, a leading orthopaedic surgeon at Hadassah Medical Center. Together with other members of the Hebrew University BioDesign group, they developed SenseGO. "This is a classic mobile health approach. By giving patients and their families the tools they need to prevent the development of ulcers, we can dramatically reduce health care costs related to diabetes," noted professor Yaakov Nahmias, director of BioDesign programme.